I am really sorry to have to do this to you, but I have the best cupcake recipe to share with you today. 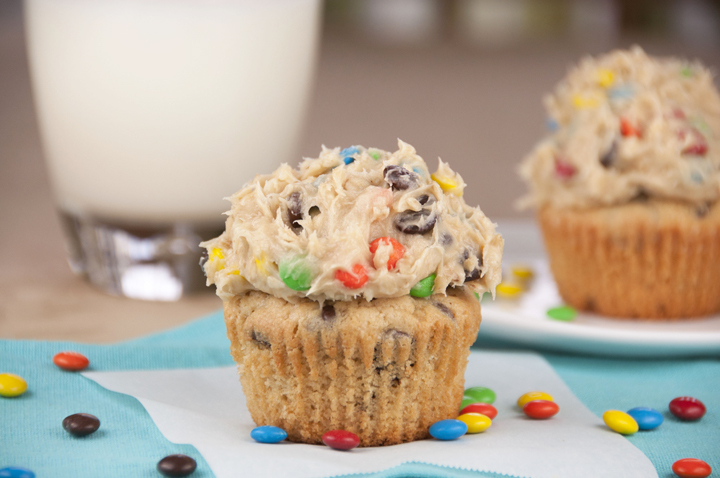 Break out your stretchy pants before you bake these Monster Cookie Dough Cupcakes up because these cupcakes are FAN-TAB-ULOUS! I just might sneak another because I know once Mr. Wishes gets a hold of them, only crumbs will remain. If you like this recipe, come follow along on Instagram where I share all of my new ideas! I had a hankering to make cupcakes the other day and I then realized something very sad: I have no cupcake recipes on my blog! How could this be?! I don’t know how I let this go on for so long but it’s about time to change that. 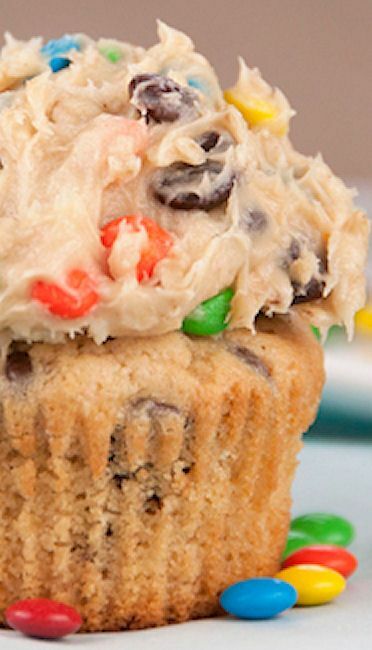 These Monster Cookie Dough Cupcakes are amazing in every way. You have to really like peanut butter, obviously, because there is a good amount of peanut butter that goes into these cupcakes, as well as in the frosting. Peanut butter lovers will definitely double their pleasure with these. Basically, this is a super moist and rich peanut butter cupcake, with chocolate chips, and monster cookie dough frosting to top it all off. The mini M&M’s for the frosting can be hard to find sometimes at the store, but you can buy them here! If your frosting is runny, then you probably need to add a little more powdered sugar. Do not be afraid to add this extra powdered sugar to bring the consistency of the frosting to where you want it to be as far as thickness goes. You might also like my cookie dough bread! I also very highly recommend you try my no-bake chocolate chip cookie dough bars. View My Step-by-Step Video and Tips on How To make these cupcakes! 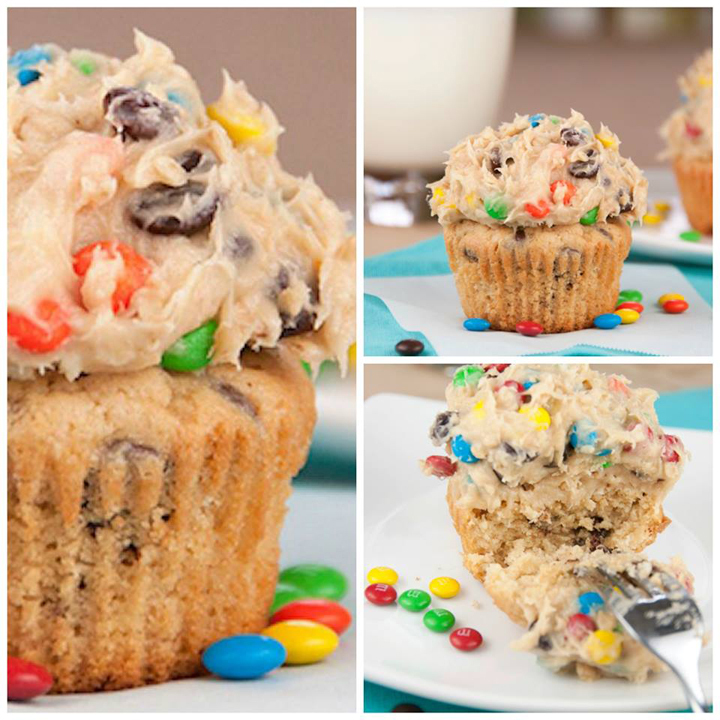 Rich peanut butter cupcakes topped with a sweet and loaded cookie dough frosting packed full with peanut butter, chocolate chips and M&M candy! This is the best cupcake recipe! Use a hand or stand mixer to whisk together all of the cupcake ingredients except for the chocolate chips. Then, stir in the chocolate chips with a spoon or spatula. Fill each cupcake liner about ⅔ full of batter. Bake for 20 minutes or until toothpick inserted comes out clean. Let cool on a wire rack. Mix in the powdered sugar 1 cup at a time (1 and ½ cups worked out best for me). Oh yum, these look dangerously good! I’ve pinned it to do it later and then we’ll see if this is indeed the best cupcake recipe ever. ;))) We’ll be both winners when I taste it. M&Ms and cupcakes: yum! Let me know how you like them if you try them out! haha I’ll do my best! All I heard was cookie dough…I don’t need to know anything else….I want them! I agree – cookie dough is the best thing ever! You are a genius. Cookie dough frosting. That’s intense. hahah I hated myself for it too when I O.D’d on these babies! YUM! 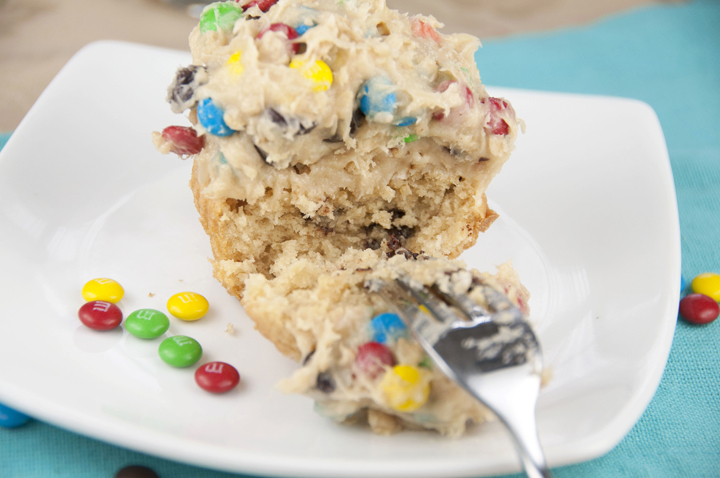 I love anything with monster cookie and cookie dough in the name 🙂 I actually have a very similar recipe that I’m sharing on Monday – seriously, cupcakes are God’s gift to bakers! Oh my goodness! These look amazing, I am such a sucker for cookie dough! I think it is great how you added the peanut butter to this! I do not bake with it often enough. These look incredible Ashley. Double the peanut butter love – you can never have too much of the stuff! Genius! These are so cute. I bet these would be delicious with a chocolate cake base too! Now THAT is a genius idea! Am I dreaming? I must be. These are UNREAL my friend. Wow. Monster cookies are insanely good- one of my favorites. and on top of a PB cupcake. Genius my friend. Just made this and they are glorious!!! This frosting is the best part! Thanks for letting me know! So glad you liked them! OMG these. look. insanely. good! I already have my yoga pants on–I’m ready! 🙂 These look so yum–great initial cupcake recipe for your blog! Is there another way to make these with out the peanutbutter? Hey, Kristi! You can try substituting any other Nut butter for the peanut butter….or maybe even Nutella?? I bet that would be good! I’m sure it will change the taste some, but not necessarily in a bad way! 🙂 Enjoy and thanks for stopping by my page! I tried these and I was told they taste like heaven in cupcake form (: great recipe! So glad to hear it!! Thanks for the feedback, Kiley! Do you miss not having oatmeal somewhere in the mix? These look wonderful, but all the monster cookie recipes I’ve seen have oatmeal in them… could you substitute it in or something? Hi, Jane! There is one cup of oats in the frosting, actually. Hope that helps! Oats aren’t cooked or anything before being put in the frosting? Aren’t whole oats hard to chew? Thanks!! The oats don’t taste dry or anything! They blend in with the frosting and give it a nice texture. Use quick cooking oats as they will be even softer! Do you have to refrigerate the leftovers? I made them this evening for work and wondering- thanks! Yes, you should always refrigerate anything with cream cheese frosting (I didn’t know that til recently!). Take them out of the refrigerator an hour or two before you’d like to serve them so the frosting has time to come to room temperature and the cupcake layers lose their chill. Thanks for stopping by, Heather! Enjoy! Well, I am going to have to make these now! They do look good. But I can’t eat them since they contain PB which I am allergic too. 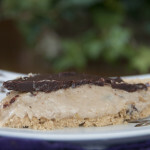 You can always subsitute any other nut butter or even Biscoff of Nutella! They are SO worth loosening your pants over! Oh my heavens! Monster Cookies are my favorite cookie OF ALL TIME, but in cupcake form? It doesn’t get any better! Cookie dough frosting?! Oh wow, that sounds incredible! Thanks, Kiersten! It definitely tasted awesome! For the cupcake mix do you use all purpose flour or self rising I’m not sure since it doesn’t say but does for the icing! Please help!!!! I will be making these soon, as per requested by my cookie dough loving husband! What your cookie dough loving husband wants, your cookie dough loving husband gets! Ashley, my little boys would simply LOVE these, thanks! Thanks, Melissa! I hope they like them! Hey Ashley I was wondering if you or any of the other ladies on here know of any substitutions for the cream cheese that wont alter the taste too mich but will make them safe to have outside (in about 90° weather) for a couple hours….I made them yesterday and theybare AMAZING!!! I want to make them for my daughters birthday party next month but it’s out side :(…any ideas? Great question and you really made me think! 🙂 I do feel like the cream cheese frosting wouldn’t hold up for that long in 90 degrees. You might be better off using a buttercream frosting (peanut butter flavor if possible!) and still putting the oats, M&M’s and chocolate chips, etc. in it so it will look the same and still taste great! Your other option would be to use non-dairy cream cheese. I did some research and a lot of vegans use that as a substitute for cream cheese in frosting 🙂 I’m glad you liked these cupcakes! You are AWESOME!!! THANK YOU THANK YOU THANK YOU!!! Telling my daughter first thing in the morning that we can still do them for her birthday 🙂 when I make the buttercream version instead I’ll l let you know how they turn out…I think the peanut flavoring will be PERFECT! Haha oh, you’re too kind! I’m so glad we came up with a possible good solution to the problem! I hope they make your daughter happy…and yes, definitely let me know how it turns out. I’m not gonna lie – they are dangerously addictive! Any oats will do – old fashioned or quick cooking! A guy I work with made these. They were wonderful! Cannot wait to make them for my 16 year old son!!! Thanks Lisa! You will love them! Can almond or maybe cashew butter be substituted for the peanut butter? I am allergic to peanuts. Hey, do I have to change anything for high altitude? Thanks. 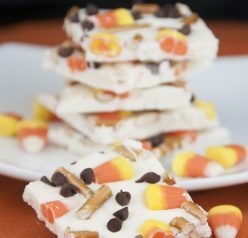 Hi, I am going to make these today! They sound so delish. I tried these. 20 minutes isn’t long enough to bake them. Can you substitute peanut butter with something else? You can use any nut butter! Or Biscoff/cookie butter! These are out of this world! Pinned! I don’t blame you at all! It’s that good! The frosting is amazing though, and I will definitely use it to top my standard yellow cupcakes. These look AWESOME! Will it make a difference if I don’t use a mixer? If you have a way of blending the ingredients well without one then definitely go for it! Hi! I just made these and they are wonderful! How do I store them? In the fridge? Can these be made without the oats by chance? Plan on making them today! Are these peanut buttery tasting, or do they just taste like chocolate chip cookie dough? Thanks! Made these today. I was a little disappointed because the photos were so beautiful and although I liked the cupcakes, I’m not sure I’ll make them again. Like another reviewer said, I found that my cupcakes needed to be baked longer than 20 minutes, I also ended up with extra frosting. No kidding that these are rich! Each cupcake has about 370 calories in it, but I did love the peanut butter flavor. I have made these a couple times for cookouts and love them, everyone who tries them loves them but always commit on how dense the cupcake is and they are dense. Anyway to make them less dense, I’m not a baker so I don’t even know where to start. Thanks! Hi Ashley, I have 2 teens, and 4 little ones, I am making these asap!! I don’t like peanut butter taste, but all of the kids will LOVE these!!!! Susan, I hope you enjoy them! Thanks for the nice comment! They are in the instructions – added in step 7! Thanks for asking, Amber! My daughter is allergic to all nuts, can you make this recipe without peanut butter? You should use cookie butter or Biscoff! You add them as is. Thanks! I really want to make these, but I don’t like oats. I won’t even eat granola bars! Is there any substitute I could use or could I just leave them out? If you make them again, try cutting the baking time down a little. Oven temperatures vary so maybe they baked a little bit too long which would cause dryness! Glad you still liked them! Thank you. Having hives from head-to-toe for a week if not longer is definitely no fun. Oh my gosh..that’s so awful. I’m so sorry you had to deal with that!! Hi! Just wanted to let you know I made these last week and blogged about the results. I linked back here to your page, and just wanted to say thanks for the recipe! My husband loved them! I’m so excited to find this recipe. I just looked over the recipe and it calls for oats in the frosting. I’m so confused by that. Does it give a dry oat taste? Yes the oats don’t taste dry or anything! They blend in with the frosting and give it a nice texture! They look a little dry…were they? How necessary are the oats to the frosting? Pingback: Chocolate Cupcakes and Hot Chocolate Buttercream frosting - Chocolate Chocolate and More! These look so good! Love the monster cookie dough frosting! Cookie dough never looked so good ! If I do not like peanut butter, what else can I replace it with? Do you have a peanut free version of this? My children are not allergic, they just don’t like peanut butter!! Do you think if I just omitted the peanut butter it would come out alright? They are always asking to sample my Choc. Chip Cookie dough batter!! I think it would change the texture way too much to omit the peanut butter completely. Do you like any other nut butter? How about cookie butter or Biscoff?? These are insaaaaanely good! My daughters and I had a blast baking them last night, and all day today we’ve obsessed about them- they are dangerous to keep in the house, lol! Especially when there’s leftover monster cookie dough frosting! Such a delicious & FUN cupcake recipe. I’m looking forward to looking around on your blog and trying more of your recipes. Thanks! P.S. I just noticed the comment about using Cookie Butter or Biscoff. I wish. But I can’t buy either where we are. thnx! Hi Elizabeth! I have used quick and rolled oats so that doesn’t matter! Whatever you have is fine. I’ve never baked this as a cake so I couldn’t tell you a specific time to bake it but it would definitely take longer than baking as cupcakes. I would just make sure to check it periodically and as soon as a toothpick inserted in the center comes out clean, take it or of the oven so it doesn’t get too dry. As far as the peanut butter goes, I wouldn’t leave it out completely because that would mess too much with the texture and thickness of the frosting. Can you use any other nut butter?? Hi! And thanks for taking time to reply. I’m allergic to nuts. 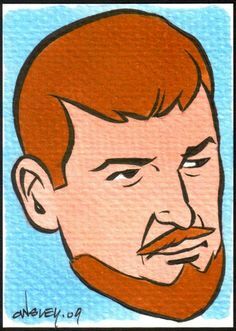 No TJ, etc. So I decided to look up recipes online for cookie butter. I found 2 completely different ones. Yet the general idea seems the same. I think I will try to recreate a speculoos spread n take it from there. Thanks so much for your help. Should be fun! Aww I’m so sorry you have to go through all of that trouble! I wish I knew of an easier way. They could open up a TJ next door to me!!! That would make me very happy. Although they’d have all of my money! LOL! You don’t have TJ either? We are deprived. Esp if you used to live near one, then it’s worse! We have one here in Rochester but it’s about 40 minutes away so I never make it out there! I’m wanting to make these as mini cupcakes. How would I adjust the baking temperature and time? Thanks! The kids and hubby aren’t big peanut butter fans how could sub out the peanut butter? Any other nut butter or cookie butter would work! These look amazing. I was wondering if you’re using a 1 pound bag of M&Ms or a smaller size? Thanks. These are in the oven right now – going to sub mini reese’s pieces for the mini m&m’s in the frosting which I think will be perfect with all the other peanut/chocolate flavours. Happy Thursday and keep on baking! Frosting was delicious, but the cupcakes were dense little hockey pucks. What did I do wrong?! Or are they supposed to be like that? Yes, you can use regular. Just use less. What would happen if you didn’t add the oats to the frosting? I’m allergic to them ???? The texture would be a lot different but I think you could make that work! Is the batter pretty thick? Can the peanut butter be omitted? Yes, but replace it with some other nut butter or cookie butter so the texture remains the same. These are amazing! I doubled the recipe and they still came out perfectly! 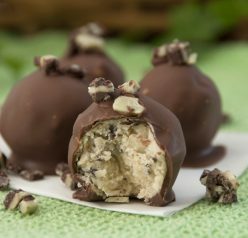 I’ve made these before – so delicious! Wondering if I can take the peanut butter out due to allergy and the baking consistency still be ok? Or if there is an easy substitute?? I want to make these using box cake mix, any suggestions? These look so good! I was planning on making them soon but wanted to ask- have you ever piped the frosting? I was going to use an extra large round too and wondered if the frosting would pipe well. Just thought I’d comment since I stop by once a year 😉 I LOVE this recipe! I make it every year for my sons birthday. He will be 5 on Wednesday so this is my 5th time around. I might look forward to it more than he does ha!! Oh my gosh – I love this!! Thank you for the comment! Hi! Sounds amazing!! Can’t wait to make them tomorrow. I’m making them the evening before the event. Since there’s cream cheese in the frosting do they need to be refrigerated?